Superb spacious holiday villa, for up to 10 people, in the authentic Haute-Saintonge countryside of the Charente-Maritime. Relax and unwind in this exceptional location. Quality controlled accommodation. 4-star national rating. 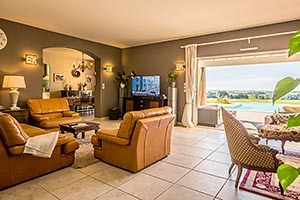 The spacious living area has large patio doors leading to the pool and there is a superb covered terrace with comfy furnishings – ideal for that evening drink watching the sun go down over the vineyards. 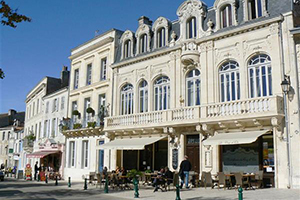 You will be astounded by the vast range of tourist attractions and places to visit in the Charente-Maritime. There are hoards of activities for the children, medieval towns and dozens of chateaux to visit, theme parks in abundance, colourful local markets, not to mention the local Cognac and Pineau producers. There are spectacles and events throughout the summer season - so never a dull moment. If you can tear yourself away from the poolside or the nearby bathing lake at Jonzac, (heated by a natural spring) the coastal area around Royan and leading down into the Gironde estuary is well worth a visit - sleepy fishing villages, salt marshes abounding with birdlife and sumptuous sea-food to enjoy. Within half an hour you have and aqua-playground complex and health spa, the medieval town of Pons, the Cognac discovery centre "Maison des Vignes", a casino, river fishing, a go-kart track and much more… Further afield you can enjoy a visit to the historic towns of La Rochelle, Saintes and Cognac, the islands of Oleron and Re or head off for a day trip to the fabulous city of Bordeaux and the Medoc wine region. 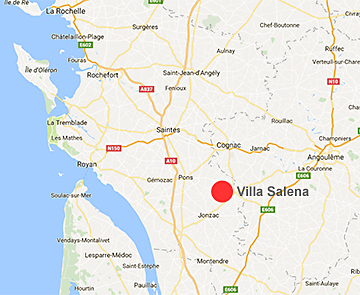 Villa Salena is in an ideal position for exploring the delights of the Charente-Maritime, a region renowned for its exceptional climate and its wealth of French culture, that was recently spot-lighted in France Today magazine. Situated near the towns of Pons and Jonzac in the “Haute-Saintonge” - the heart of the Champagne-Cognac region. 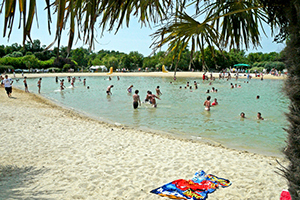 About an hour’s drive takes you to the Charente coast at Royan, whilst at just 10 miles / 16km you will find a lovely bathing lake with plenty of activities for the children. The villa has 5 bedrooms and 3 bathrooms, accommodating up to 10 people in comfort. There is a lovely lounge terrace with a magnificent view, as well as a further covered dining terrace. The 10 metre heated swimming pool is equipped with a safety alarm and it can be closed off by a removable fence for peace of mind with young children. All the comforts of home, including a well equipped kitchen, a huge TV, a DVD player (with home cinema sound) and WiFi internet. In addition there is a games room with gym equipment and a TV set up for video games, plus table tennis in the garden. Vast lounge with a view to the pool terrace. Separate dining room. Spacious accommodation with bright modern decoration. Historic town centre, punts on the river and a chateau to explore. Heated water... restaurant, canoes, pedalos, chidrens's activities. In the village Sainte Lheurine, 5km / 3 miles from shops and restaurants at Archiac. Near to the town of Jonzac (10 miles / 16km). 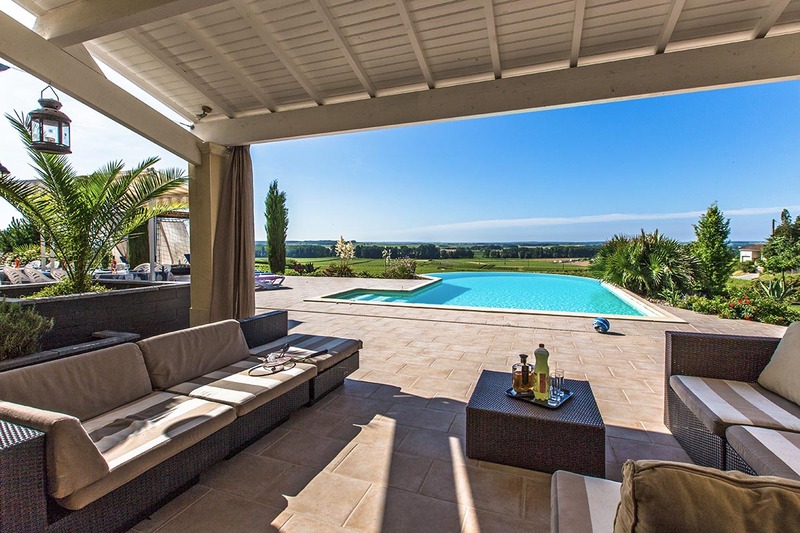 Easy access to Cognac, Saintes and the coast around Royan and La Palmyre. The Charente-Maritime is on the west coast of France, from La Rochelle in the north, and stretching down towards Bordeaux in the south. Hurry, now booking for 2019 !! Low season : From € 1500 for 7 nights, 10 people. Mid-season : From € 2030 for 7 nights, 10 people. High season : € 2800 for 7 nights, 10 people. Full end of stay cleaning service available at € 120. Rentals in July and August are by full weeks, Saturday to Saturday. Outside these dates we can propose other durations and start days, minumum 4 nights. Consult the availability of the villa (accurate in real time) and the prices.